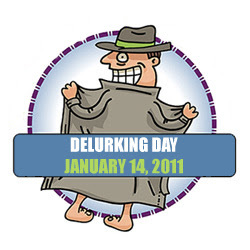 What in the world is delurking day, you ask? So, delurking... that would be this very special day when you come out of hiding. Take a minute to actually click and make a little comment. Right here on my blog... not on twitter or facebook. Right here. Let me know you're out there reading. If you read and comment regularly... I love you! Comment again!!! If you read and think... eh... she doesn't really care if I comment. What do I have to say? Comment now!!!! I do care! I love comments. Supposedly there are about, oh, 93 or so of you out there on google friend connect. And... well... feedburner claims there are about 165 or 216 of you subscribing to a feed of some sort (depending on what day I look and how it decides to be on any given day). And if you can't think of a single thing to say... just "hello I'm here today!!! is fine. (Actually, any comment is fabulous today!) Or take a second and share a link to one of your favorite blogs. I'm going to spend some time today doing some delurking of my own... and it would be a great day to visit some new people. I'll start with sharing... I personally want to thank Loralee at Loralee's Looney Tunes for her Delurking Day post. Last year I totally missed out on Delurking Day. Today... I'm getting in at the very beginning because she posted at the very beginning! Such a silly thing to be thankful for... but one of the best things about blogging is the comments. I love Loralee's blog. She's hysterical. And she writes in such an honest way. And... I actually was able to see her speak on a panel at BlogHer in NYC last summer and say hello to her in person. Go visit Loralee and comment there too!